I understand what The Land of Steady Habits was trying to do, quite desperately so, but I cannot understand its methodology or its lack of self-awareness. This is the kind of film that functions only as an amalgamation of better, more honest and direct stories. The movie has a few fine performances, and it dares to confront grief and depression and addiction, but it never approaches any of these hard-hitting topics with their inseparable sense of raw vulnerability. The Land of Steady Habits has no aggression and no attitude, and never earns the sparse offensive attacks it rarely and casually deploys. It barely hits the target, and is all too comfortable dancing around in its own corner waiting for the ringside bell to go off and solidify its inevitable defeat. 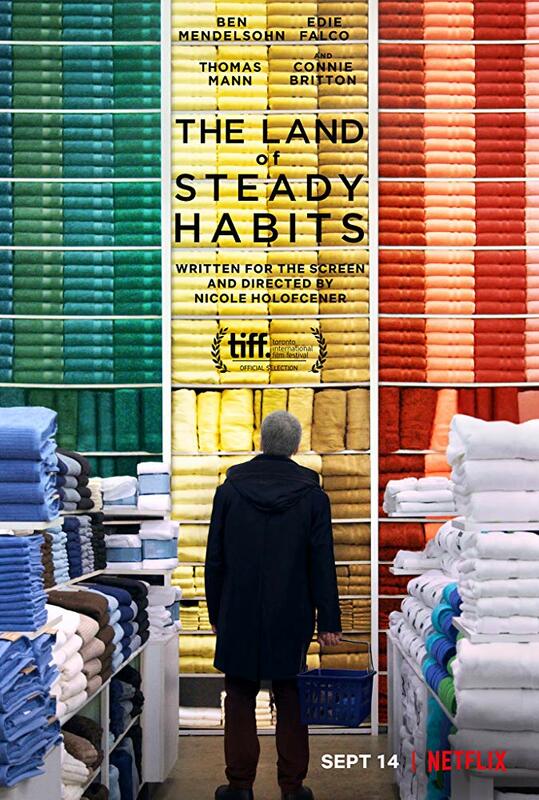 Set during the Christmas season and located in the affluent communities of Westport, Connecticut, The Land of Steady Habits sees the holiday and these posh, up-scale neighborhoods through a completely commercialized gaze. In this Eastern port of America, massive form and grandiose stature matter more than function. 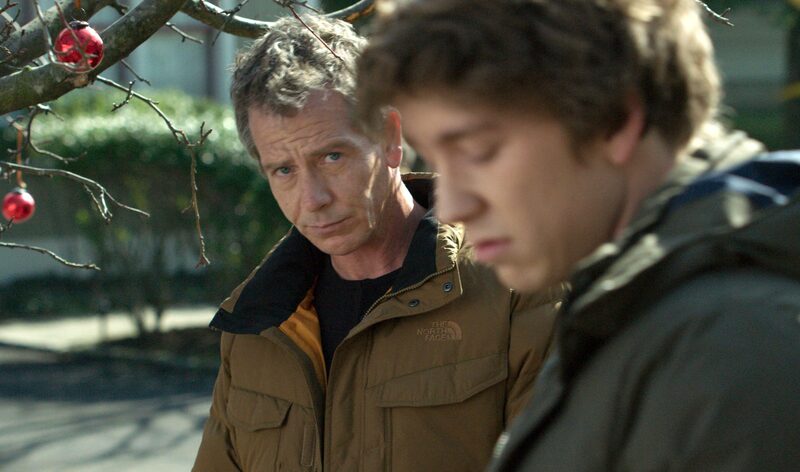 Anders Hill (Ben Mendelsohn) wants out. He retires early from his secure finance job, divorces from Helen (Edie Falco) while leaving her the stately home, and shifts into condominium living. We see him wander through middle-age, sleeping around with strangers he picks up at Bed Bath & Beyond and some local shops, refusing to embrace the lonely path he’s forged. His actions make little to no sense, mostly because he’s not fully developed as a character, but also because he is a man in crisis. That the problems are of his own creation only make the drama even less compelling. There’s a subplot with a young man named Charlie (Charlie Tahan) – a drug addicted youth and the son of family friends – who becomes a cohort of sorts for Anders. They’re both broken individuals who look at each other with fragile eyed empathy. And yet the friendship doesn’t become much more than a one-way transaction. Anders kinda-sorta starts to date a new woman (Connie Britton). Meanwhile, his 27-year-old son Preston (Thomas Mann) – by far the most interesting character in the picture – floats through life with little ambition or effort. The Land of Steady Habits creates these relationships quite forcefully, and the movie spends so much time exposing the faults of so many different people that it doesn’t give itself the chance to resonate on a personal level. I believed the drama, yet I never believed the people trying to purport it as reality. While I’ve only seen two of Nicole Holofcener’s films, those being 2010’s Please Give and 2013’s delightful Enough Said, this is the first time I’ve been disappointed by a story from her. Everything is stretched so thin and still expected to carry a heavy amount of emotional weight, and not only is the baggage unworthy of being carried, it’s just not interesting either. The Land of Steady Habits is a film mostly full of unbearable, unknowable people who are victims only of first-world problems, and if I really wanted to watch upper middle-class white folks suffer through the pain of living, I’d much rather watch Sam Mendes’ masterful 1999 film American Beauty. Both movies tackle the same territory, but only one has personality and vision and a unique, deadpan voice. The Land of Steady Habits is droll, sedated, and cursed by its lack of imagination.